Playwright Marcel Dorney once remarked to me that Australian art is always asked to reflect the views of the majority, more so than art is required to elsewhere. An astute observation, particularly as I ponder those dot-painted boomerangs that used to be all that Perth had to say about its local art scene. The first work I saw at PIAF, an eight-hour American family saga, was as specific and multi-layered as those boomerangs are not. 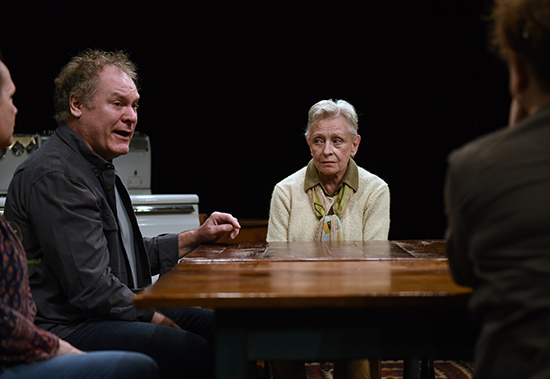 There is so much that is noteworthy about The Gabriels, a trilogy of naturalistic plays by Richard Nelson, each set on a specific date in March, September and November of 2016, and centred around the kitchen table in the Gabriel family house in Rhinebeck, a town in upstate New York. The first might be just how naturalistic it really is, a kind of carefully observed recreation of reality that is never, ever produced in Australia. It is a naturalism of so many details that it bypasses gesture and recreates a certain feel for three-dimensional reality: the naturalism of socks and clogs, of knives and garlic, of conversations that trail off, of inaudible dialogue, of things left unsaid—not for the purpose of creating a dramatic pause, but because people often don’t spell out their lives to those they love and speak to often. The three plays, Hungry, What Did You Expect and Women of a Certain Age, were originally written and performed separately, each set on the date of the premiere, each rewritten to reflect current affairs right up until opening night, and despite the subtitle (and the way in which the last play takes place in the early evening of the election day), Donald and Hillary loom in the background as merely one part of the world that unfolds before our eyes slowly, gradually and in all of its lifelike complexity. In March, Mary Gabriel has just buried her husband Thomas, a playwright, and his family has gathered in the house, confused and bewildered in that quiet way of life: there is a house to live in, interlocking mortgages, aging parents, Thomas’ belongings, Mary’s expired doctor’s licence (she took time off work to care for her dying husband), and nobody quite knows why Thomas’ first wife Karin is intent on staying for dinner. The year passes in aftershocks of that loss: Karin moves in to help order Thomas’ papers or perhaps to keep Mary company while she rebuilds her life; the aging mother Patricia has moved into a nursing home and her health is rapidly declining and her mismanagement of family finances is coming to the fore during the inheritance settlement. We meet Thomas’ siblings: costume designer Joyce who lives in New York and may or may not be gay; and George, carpenter and piano teacher who stayed in Rhinebeck with his wife Hannah, a caterer, and now has to deal with the dynamics of gentrification as the New York wealthy spill over from Long Island. Watching The Gabriels is like visiting your American friend’s family home, being privy to conversations that involve both neighbours you don’t know and politicians you do. It is an experience of making sense of the world while observing the lives of people you gradually learn about: their financial decisions, their political decisions, their decisions to trust and to mistrust, to relent or push through. There is the macro class disappointment with the New Yorkers who move to Rhinebeck and publish entire books about the white privilege of the village, blind to its working class history and failed industries. But there is also the micro-sadness of coming to terms with the eroding financial accountability of an aging parent, and balancing unexpected debts with a child’s college loan. There is Mary’s growing realisation that her home is no longer hers, and that her grown-up daughter from her first marriage is no longer close family. There is Karin’s quiet insistence on belonging to “the Gabriels,” having kept her ex-husband’s surname and having, it appears, nowhere else to go—she is an unmarried actress with a small apartment in Manhattan, and art, for all its presence in the conversation, is not as solid as that family kitchen. The Gabriels make space for Karin’s presence, first awkwardly, then habitually, as the year goes on and she becomes a valuable interpreter of Thomas’ life in the arts. The tremendous naturalism of Nelson’s plays makes space for it all, the great and the humble, the complication that is ordinary life. During the eight-and-a-quarter hours of observing this family shuffle around the kitchen table, chopping vegetables and pulling ready dishes out of a real, working oven, I wondered repeatedly about Dorney’s observation about art and the majority view. It occurred to me that something else is at play: so much naturalist theatre in this country falls short not because it accurately represents the majority, but because it is invested in upholding myths of what our country is, myths that were always only a flattened version of reality. 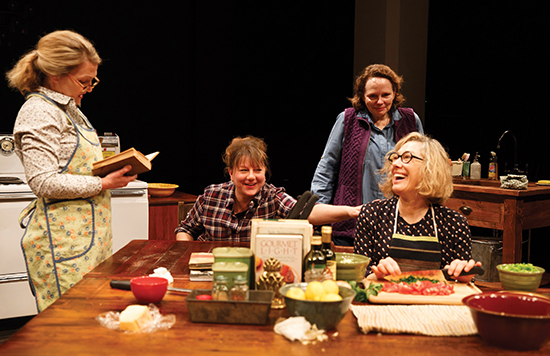 The pleasure of watching The Gabriels comes largely from the absence of grand narratives upheld by the text. It is not a play ‘about’ class, or about family or about politics, though it contains them all. Though they might dread the presidential debates and make a sideways sigh, “Be human, Hillary!”, the Gabriels are not there to represent a left-leaning middle class with artsy professions, nor provincial working class hicks with hearts of gold. We are never in danger of seeing these as political plays, or of understanding the plot as a microcosm of larger social processes à la Jonathan Franzen’s great tomes on contemporary America. There is something here to be said for individual maturity, for these are characters who can observe ideology and groupings without ever losing sense of themselves as built out of a variety of roles: as daughters, wives, mothers, employees, cooks and voters all at once, each role bringing its own agency along. It might be that the Australian settler identity, rooted in the collectivism of unions and racial laws, hasn’t yet identified this Enlightenment individual, this person with agency that goes beyond any particular group belonging, and perhaps that is why naturalism in Australian theatre is so often accused (rightfully) of being ideological and reductionist. Who knows? Either way, Richard Nelson’s The Gabriels is brilliant.